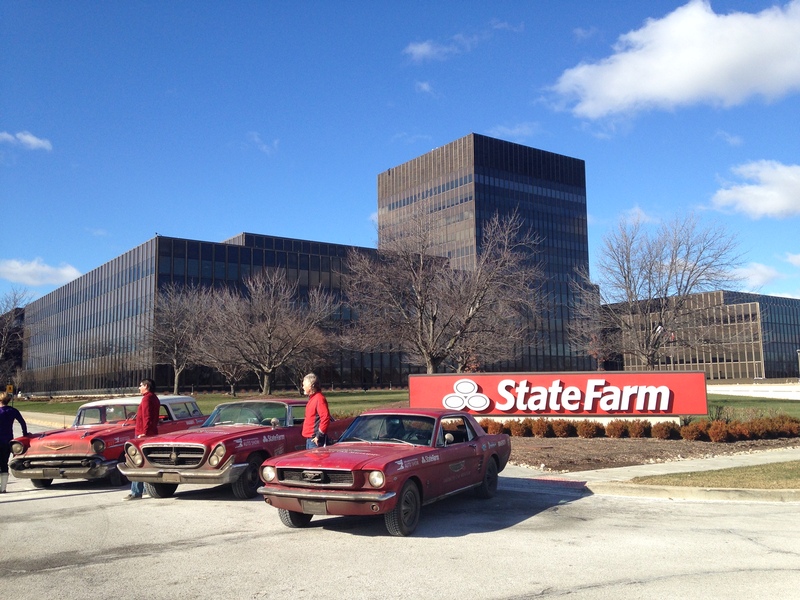 After a great night in St. Louis at Hyman Classic Cars we crossed the flood swollen Mississippi and arrived at State Farm headquarters in Bloomington, Illinois, where we were greeted–as you see in photos – by Director of Marketing Ed Gold and colleague Tamara Harvell. It was Ed who I approached with the idea of The Drive in September 2014 the day after Rod Alberts and I concocted it. Without hesitation he said State Farm is ‘in’ and it was his commitment that enabled me to know we could do this and put the planning in gear! Thank you, Ed! 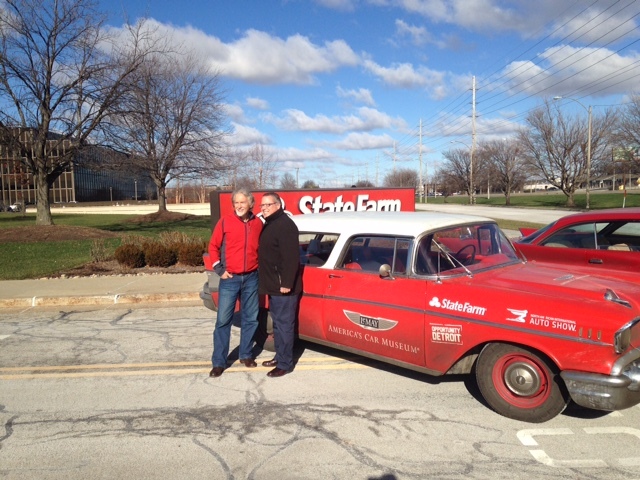 We had an enthusiast event hosted by State Farm at US Cellular Coliseum later this afternoon. Stay tuned – less than 500 miles to go! 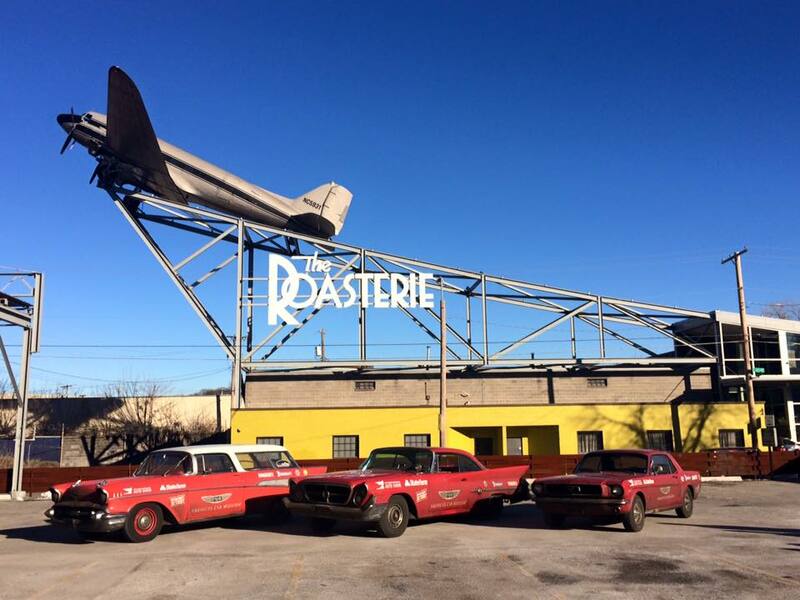 This morning was cold and sunny as we fueled up in Kansas City and headed to The Roasterie a popular coffee haunt downtown. Again Mark McKee of Ace Cafe and the Kansas City Automotive Museum organized a coffee and cars gathering. Nearly 40 collector cars were driven to the event and close to 90 people participated! After two hours of tire kicking and conversation and remarks by me we began the drive to St. Louis followed out of town by several cars. As before many enthusiasts thanked us for bringing the trip to their home. 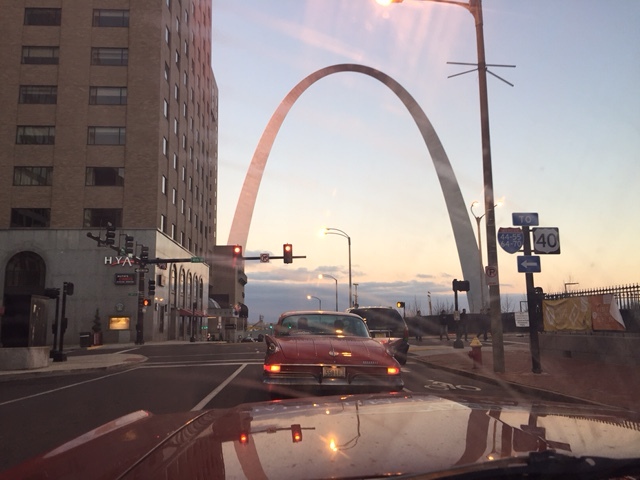 We made a dash for the iconic St. Louis arch catching a few photos just as the sun set. Then headed back west to Hyman Classic Cars for a reception and dinner hosted by Mark Hyman, a successful classic car dealer and friend. About 40 collectors were in attendance in the midst of a beautiful array of cars. I focused our remarks on the Hagerty Education Program at ACM as there were a number of young people and professional restorers in the audience. Mark was generous in his remarks about the Museum as well. We are excited as tomorrow we go to State Farm headquarters in Bloomington, Illinois, for a late afternoon event our good friend Tamara Harvell has planned. State Farm –the Presenting Sponsor of ACM once again in 2016 –has now supported the Museum for ten consecutive years! We look forward to celebrating that relationship tomorrow. The cars were strong today. Like horses headed to a barn they seemed to really want to run today! Fuel mileage remains well above what we expected. 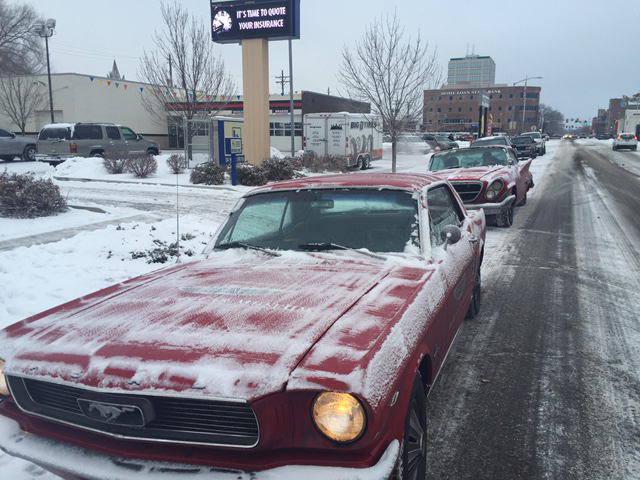 The Mustang and Chrysler have yet to need any oil! The Michelin winter tires which served us so well in snow and mountains continued to impress me–winter tires are often loud on dry pavement at high speed. These tires are amazingly quiet! Only three more driving days and less than seven hundred miles to Detroit! Today’s departure from Kansas City was the warmest we’ve had, in more ways than one. We started with a cars and coffee meet, organized specifically for the crew of The Drive Home, our continuing cross-country trek from the LeMay-America’s Car Museum in Tacoma to the North American International Auto Show in Detroit. I sent out a call to Hemmings Nation to show up in force to cheer us on and they responded in spades. 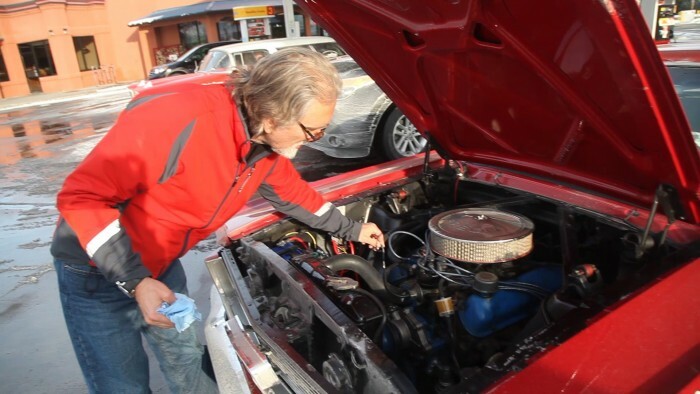 Approximately 40 collector cars braved the brisk morning to show up at The Roasterie in downtown Kansas City for coffee and camaraderie. The venue could not have been better; suspended above the café is an actual DC-3 aircraft, and the inside coffee bar features a counter that resembles a huge polished engine nacelle. Caffeine nirvana for gearheads. It’s hard to justify the argument that our ACM cars are too valuable to drive in winter when a guy is willing to show up in a pristine Tickford-bodied 1950 Aston Martin DB2/4. Kansas City is a huge car-loving town, and they are not afraid to use them. After all, cars are about experiences and creating memories. 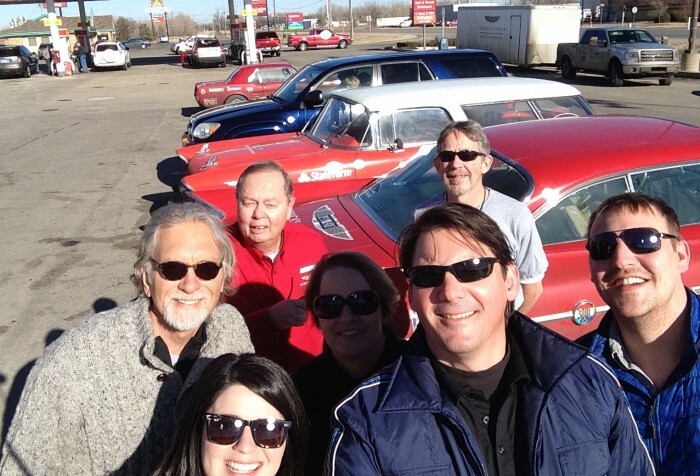 The best part about these gatherings is hearing the terrific stories that car ownership generates. Guys are wide-eyed and enthusiastic in the telling of their greatest barn finds. Cell phone pictures are shared as if they were photos of children or pets. Today we woke to a bitter Kansas breeze needing to scrape our windshields and take extra time to warm the engines. 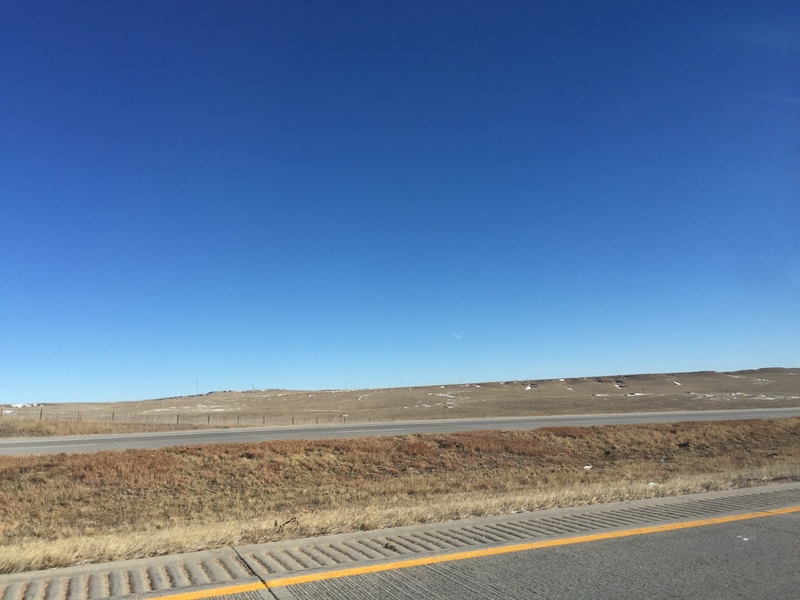 That said our relatively short drive to Kansas City was marked by sunshine and blue skies. The weather gods were with us for I’ve experienced blizzards with high winds on these same roads and those conditions are tough–often deadly. Not today, the cars ran so easily that when we found the best rest stop of the trip thus far–a Shell station with Starbucks!–we dawdled for nearly an hour. We also took about a half hour to explore the dirt roads of a nearby farm community just for fun! Our good friend and Steering Committee member, Mark McKee, who lives nearby, had organized an enthusiast gathering and Kansas City barbecue for us! The beef, ham and baked beans were ‘out of this world’ and accompanied by great slaw and potato salad. I skipped lunch and didn’t hold back! Mark organized the gathering of about 40 collectors at the Kansas City Automotive Museum who welcomed us to their facility. Among them were a number of ACM members who support the Hagerty Education Program at ACM. They were thrilled when I introduced a McPherson Colllege student from KC who had received a HEP internship last summer. Jason’s internship was at ACM and he worked on the cars as they were being prepped for this trip. He was excited to see the cars and proud for his part in The Drive Home. Diane Fitzgerald, our National Director of HEP joined us today and will participate with us over the next few days as we pay particular emphasis on HEP in events in KC, St Louis and Chicago. It’s good to have her with us. 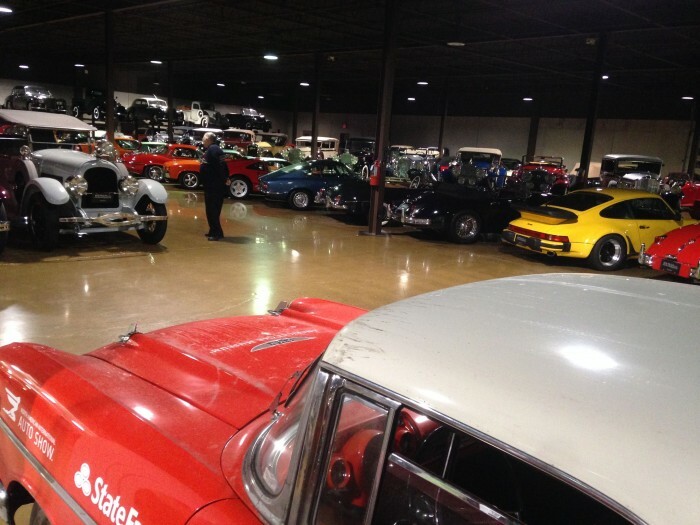 The Kansas City Automotive Museum is a modest place compared to ACM –perhaps some 15,000 square feet in total. It has a small but dedicated staff and committed founder whose vision is for the museum to be at the hub of the car club culture in KC. I was impressed with their plans, their goals and their vision and spent a good amount of time with the founder and the director. Some of their staff were quick to inform me they had visited ACM and we’re delighted we had elected to do these gatherings with them –they are helping organize tomorrow’s event too. I emphasized our vision is one of collaboration and shared experience and that we will welcome collaboration where opportunity exists. They share that orientation and welcomed my commitment. Tonight journalist Henry Payne of The Detroit News joined us and will participate with us at the Cars & Coffee in downtown KC tomorrow, take a turn behind the wheel and join us for the gathering at Hyman Classic Motorcars in St Louis. In spite of the flooding there they say we can get through! Kansas City has a thriving enthusiast culture and reputation for warm hospitality –a hospitality which we were privileged to receive today due to our good friend Mark and new friends we continue to meet on the road. I was afforded an interesting perspective today. For the first time in seven days, since we began this cross-country journey from the LeMay-America’s Car Museum in Tacoma to the North American International Auto Show in Detroit, I was driving something that wasn’t made before the Kennedy Administration. A computer crash necessitated a quick trip to an electronics store to purchase a new laptop. I jumped in our modern support vehicle and I immediately felt as if I had sat on a giant marshmallow and sunk into it, its padded leather interior forming around me. Gone was the airy greenhouse of the ’61 Chrysler, replaced by high body lines and minimal glass. The purposeful Exner-era dash was now an incomprehensible array of LED lighting and buttons. Instead of a car that you could jump in and drive with a moment’s instruction, I was in a car that felt like I needed an owner’s manual and a degree in Information Technology to operate. Sensory overload. I cut two people off and was honked at once. By William Hall. Photos by the author and Derek Klein. 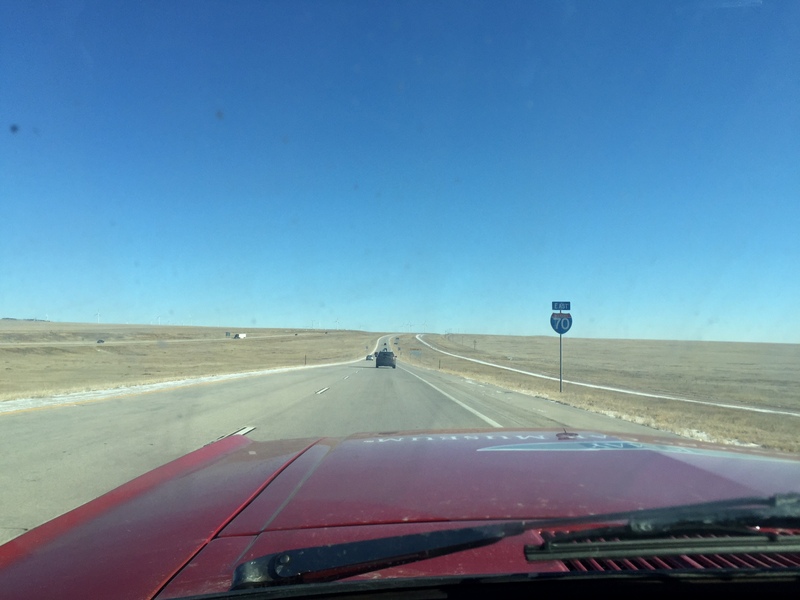 Our much anticipated crossing of the Continental Divide is upon us, and we could not have been luckier with the weather. It’s clear and mild, but the biggest road hazard is the snowmelt spray causing havoc with our windshields. None of the cars have working window sprayers…so instead we employ spray bottles directly onto the glass. It works remarkably well, and is a more effective delivery of the large quantities we are going through. 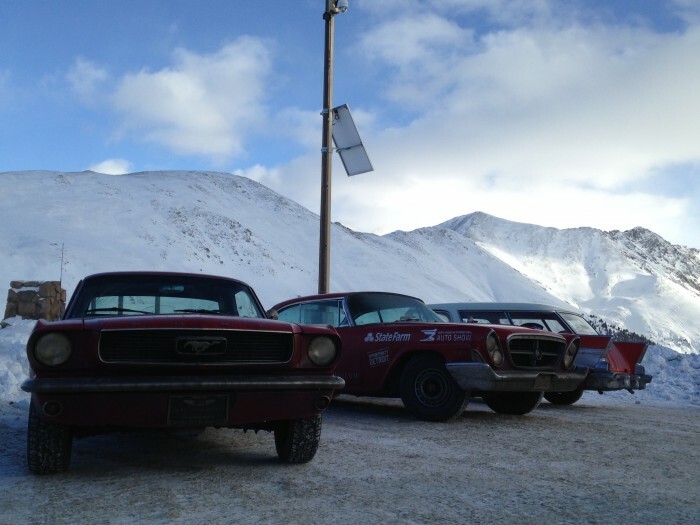 The only downside to the sunlit ride is the temporary suspension of the Sludgecicle Challenge, another of the amusing competitions we have developed between the three cars to hang the largest icicle off the bumpers. Sadly, our hopes of delivering a pure Pacific Northwest icicle to the steps of the Cobo Center in Detroit will have to wait until next year. We spent an enjoyable New Years Eve at Club Auto Colorado at a party for enthusiasts hosted by our long term sponsor Hagerty. 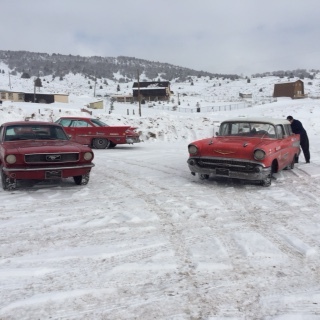 In their typical impeccable fashion The Hagerty staff greeted us on arrival warmly and helped us wheel the dirty cars into the clubhouse, laying out sheeting to catch melting snow, helping us set up displays and providing us refreshments. They were in the midst of finishing decorations and setting up bar and catering. When the 40 or so guests arrived the DJ kicked off music and we all began to mingle while looking at the amazing cars belonging to members in the club. I gave brief remarks about the museum, why we and NAIAS were doing the drive, the importance of our members and sponsors and the like. I also made a presentation to Cherie Eagen in memory of our good friend Rick who died several months ago. I also presented Derek with a commemorative magnum of our Drive Home ACM wine–courtesy of Hedges Family Estate. Guests asked lots of questions and several indicated they have been to ACM and love it. All in all we had a wonderful time and made new friends thanks to Hagerty. After a SHORT night we departed club auto joined by several couples from the evening before who had returned to wish us well and four cars escorted us for the first 50 miles or so on our way to Kansas. Once again we experienced real welcome from people we did not know but who were enthusiastic about what we are doing on The Drive Home. The 375 mile drive was uneventful as we drove seemingly in a straight line till the final exit. I remember the GPS indicating 300 miles to our hotel and the first turn at mile 298! We joked about how different the landscape and driving was from all before. Virtually all one could see in every direction were blue sky and ‘Amber waves of grain’. Periodically windmill energy farms, irrigation systems, silos , feed lots with cattle and small towns dotted the landscape. Driving alone I slowly became aware of the beauty around me–which intellectually I had dismissed in advance as boring. I understood that while some love purple mountains others love big skies and amber fields of grain. One’s perspective is shaped by experience of life. Tonight we are in rural Kansas in a Fairfield Inn having had dinner at the Golden Corral buffet a parking lot walk away. Back to the hotel for a night off of rest after experiencing a world so different from ours at home yet every bit as much a part of America. Driving I-70 today we called out license plates from Maine to New Mexico and Florida to North Dakota. And I was aware why I love road trips and cars far more than airplanes and mass transit. By auto I drive in and through the vast diversity of our country and its peoples. I meet kind folks at gas stations and restaurants who smile, chat briefly and wish you ‘godspeed’. I see, feel and smell changing landscapes and air. I taste salmon on the west coast, lamb in Colorado and barbecue in Kansas. I stop for coffee, to see an historic landmark or explore a small town when I want to not at a predetermined stop set by some corporate accountant for efficiency’s sake. We loved the auto in the heady 50s and 60s for it brought us freedom and the ability to experience America. Many of us love it today for the same reason. A flight over the country is sterile and homogenous by comparison. I hope as we are pushed into robotic cars so we can work on our computers or play video games as we travel that the bureaucrats in government and among the OEMs remember that many of us still want to drive and experience America in all its diversity and wonder. Tomorrow on to Kansas City and barbecue! 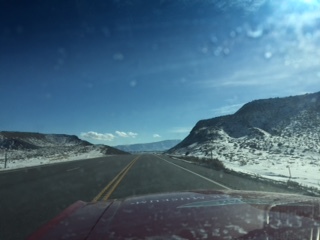 A beautiful drive from Grand Junction to Glenwood Springs and on to Lakewood. Rather than stay on the interstate through the Eisenhower Tunnel I decided to take us up over the 11,000 foot Loveland Pass on two lane road. Spectacular! And thank goodness for Michelin tires which easily conquered snow and ice! That put us over the Rockies and a great downhill run to Lakewood where Hagerty is generously sponsoring a New Year’s Eve party! Check out my shots, but then visit The Drive Home page for a video recap. Happy New Year! 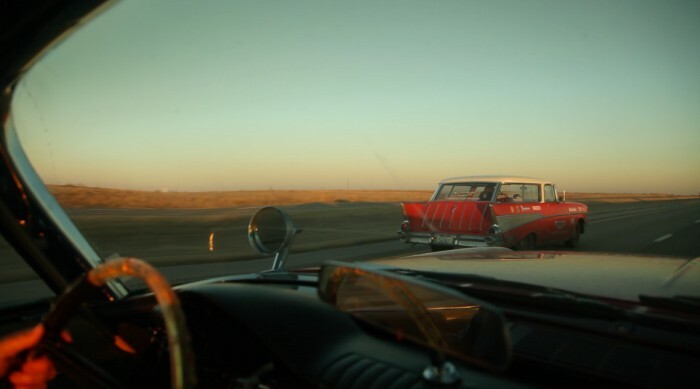 Why drive vintage cars on a journey like this? Most of the journalists, persons following the drive online and those we meet on the way want to know why we would undertake this winter drive? Many wonder why, in their minds we ‘risk’ these vintage vehicles to the rigors of such a journey and to the winter elements. We do our best to explain it and in truth there are many reasons. First of course was the always present search for innovative ways to present the Museum to the world, to raise public interest with the hopes of increasing attendance, membership and support. Related to this was our partnership with the North American International Auto Show and our mutual desire to celebrate America’s love affair with the automobile and the resurgence of the auto industry and its center – Detroit. I will write more on these things another day. Of real importance to me is the desire to distinguish America’s Car Museum from traditional notions of a Museum with cars idling lifelessly as relics of an age gone by. I argue that while driving vintage cars may put them at ‘risk’, not driving them makes their ‘death’ certain. Cars that don’t move are sad objects to look at. And driving them is the only way to give them a chance for a meaningful existence giving pleasure to driver and passengers. I espoused this differentiating attribute of the Museum early on as I endeavored to raise funds for its permanent home. Yet it really took on real meaning for me seven or eight years ago when I drove our 1931 Duesenberg Murphy J roadster on the 1,500 mile Pebble Beach Motoring Classic. In decades the car had been driven only a handful of miles–the most some 140 miles to a regional concours. It ran but not well as the seals had hardened and dried and sludge collected etc through years of inactivity. The Pebble Beach Motoring Classic is a challenging trip especially on the first day with its climbs of the flanks of Mt. Rainier and Mt. St Helens. The first few days of the journey the car’s innate strength kept it on the road but it balked on climbs and engine felt tight and as if not always firing on all cylinders. After a night of labor making valve and other adjustments the car drove more easily, it hummed and did not throb. It was able to reach higher speeds without straining as before. After some 1,200 miles or so it easily climbed the Santa Cruz Mountains and on the descent to the coast and Highway 1 the engine ‘sang’ and car loped easily down the highway feeling as if it was eager to run and run it did hitting 70 mph joyfully. At the Concours the Duesie seemed to enjoy the tour to Big Sur and cruised through Carmel drawing attention from bystanders. That drive confirmed my belief that cars must be driven and that ACM must be known for giving vintage cars new life bringing pleasure to those who drive them or watch them on the road. The drive in the Duesie, the ’31 Lincoln on a similar trip and the ’27 LaSalle in the Mille Miglia also confirmed the marvelous relationship between man, or woman, and machine as those wonderful cars brought the pleasure of the open road to me. 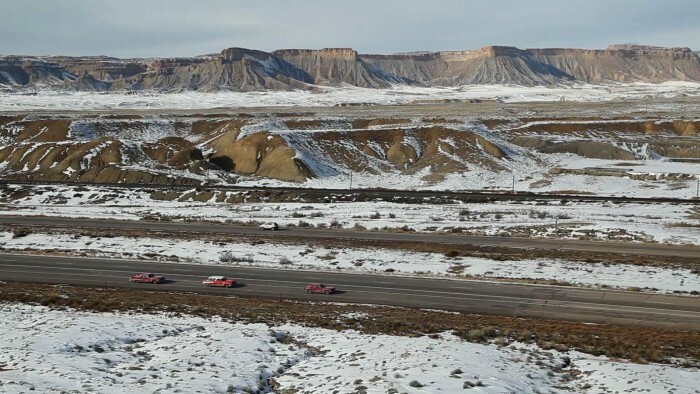 The Drive Home seeks on a larger scale and, among other things, to demonstrate ACM’s commitment to using cars for their intended purpose and to bring to mind wonderful memories to those we meet on the way, pass on the road or follow us on-line. I can tell you that one third of the way through the journey we are accomplishing these parts of our mission as truckers blast their horns and raise a hand in salute, cars keep pace with passengers smiling or calling out in support and online viewers commenting and urging us on. Many say the are ‘living vicariously’ with us as they follow our progress. The Drive Home is ‘driving home’ the point that ACM is an entity which promotes and celebrates America’s automotive heritage and is relevant to the car culture today providing opportunities for cars to be put to their intended use–driven–and giving the public the joy of seeing them on the road and resurrecting their own stories of life with the auto. More random thoughts from behind the wheel tomorrow. Photos by the author and Derek Klein. Every morning the crews light a votive candle to the Old Car Holy Trinity: Spark, Fuel and Compression. These are the three spirits we need to appease in order to continue to move this fragile expedition forward. It is a tenuous relationship, but so far the gods have smiled upon us. The Mustang being the slight exception. The car has become a “two-footer” in city traffic. It repeatedly kills at stoplights and requires one foot on the brake while the other feathers the throttle. 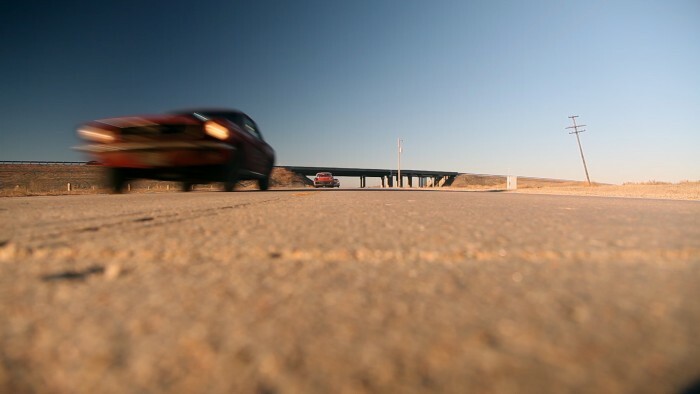 On the open road, when engaging the secondaries on the Holley, it wants to run forever. It’s the primary circuit on the carburetor that seems to be ill-suited to low-speed city driving. This is no surprise; the car is originally a “C” code 289 and certainly the heads and cam have not been matched to meet the aftermarket Edelbrock intake and larger carb. But as previously mentioned it has not dampened our enthusiasm for the car, but only requires extra attention when driving.